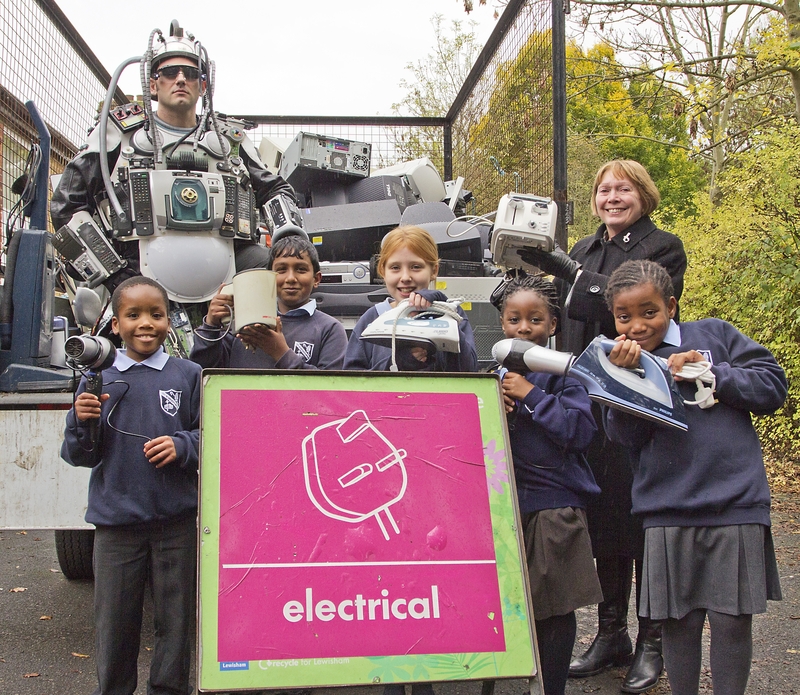 Its been a electrifying week over the last two weeks in Lewisham schools as the electronic giants of the recycling world fight it out for their cause. The fortnight began with Lewisham’s very own, award nominated WEEE Man (Waste Electrical & Electronic Equipment) who visited five schools to raise awareness of WEEE waste. 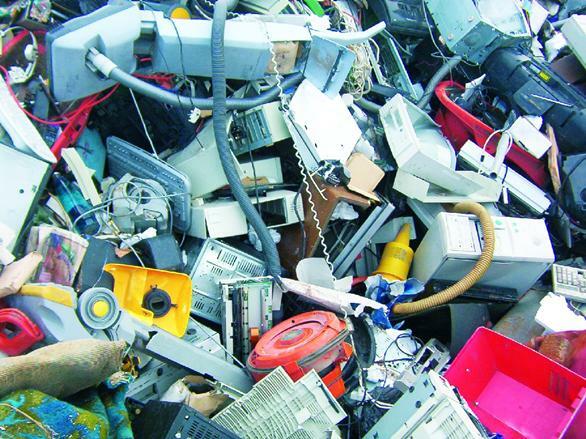 It is estimated that on average in the UK, each person buys 2.8 new electrical items a year which has led to electrical goods becoming the fastest growing waste stream, increasing by around 5% each year. 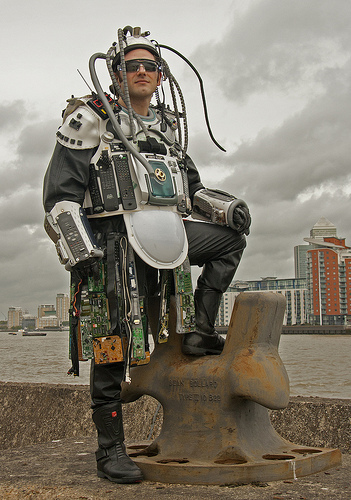 Faced with this challenge, Lewisham’s Environmental & Community Development (ECD) team came up with the idea for WEEE man- a recycling superhero created by using recycled pieces or electrical equipment targeted at primary aged children. WEEE Man and Cllr Susan Wise help out at the collection at St Augustines Catholic Primary School with children (left to right) Tawana, Sarujan, Taylor, Jada and Joan. Following the visits, the ECD team set up temporary collection points outside Tidemill Academy, John Stainer Community Primary, Adamsrill Primary, Coopers Lane and St Augustines Schools. Children, teachers, parents and residents from surrounding roads were invited to bring along their WEEE waste along and we managed to collect a large miscellaneous items including : toasters, laptops, stereos, mp3 players, lamps, mobile phones, food mixers, games consoles, irons and electric toothbrushes. Cllr Susan Wise, Cabinet member for Customer Services lent her support to WEEE Week by attending the collection at St Augustine’s Catholic Primary School. The second superhero visiting schools was Recycler the rapping robot- a creation thought up by Waste Watch and brought in to visit schools who signed up to this years Clean & Green programme. Recycler who talked, sung and danced during a 45 minute session highlighted the meaning and importance of the three ‘R’’s- Reduce, Reuse and Recycle and explained the resource lifecycles of everyday objects. 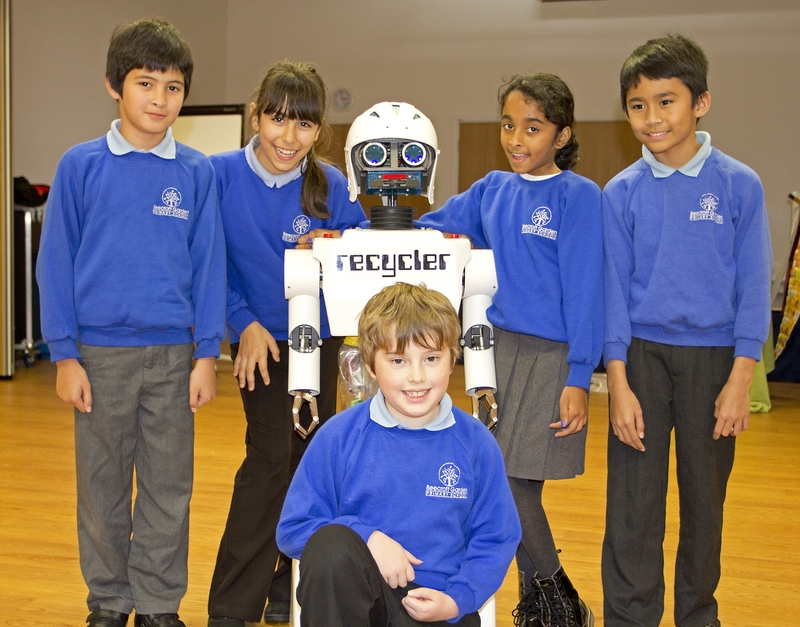 From left to right are: Mark Butler, Joana Rocha Santos, Giorgia Nair, Hilman Hazizi, Felix Biddle kneeling in the front with Recycler the robot at the centre. Shirley- Recyclers Roboteer, encourages the children to look at ways they can help to reduce their waste, giving practical examples such as taking old carrier bags to shops instead of picking up new ones and buying cereal in large boxes instead of small multipacks which have a lot more packaging. The children are then encouraged to take the message home and spread the word amongst their parents and carers. 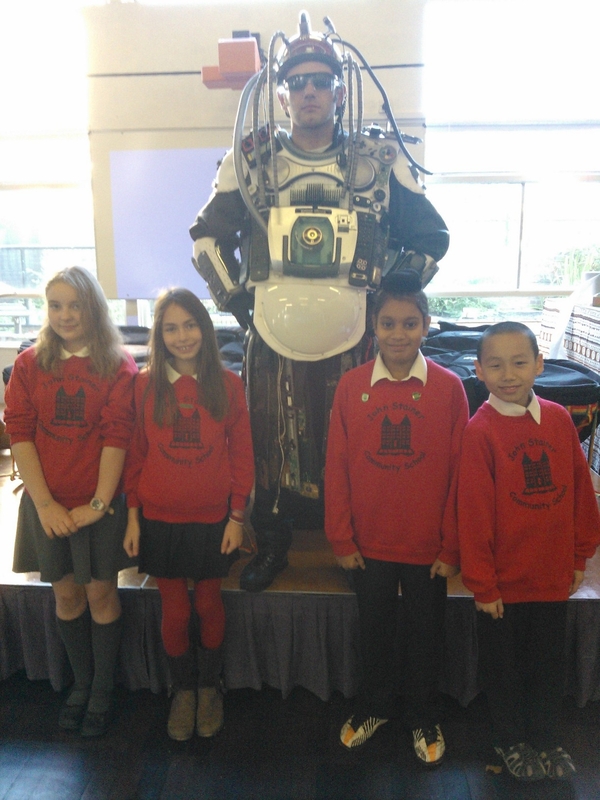 We will be doing a full review of WEEE Man’s school visits and be giving more details on how all the collections went. Categories: Environmental Campaigns, Schools, WEEE | Tags: Adamsrill Primary School, Cllr Susan Wise, Coopers Lane Primary School, electricals, electronic waste, John Stainer Community Primary School, Small appliance collection during WEEE Week 2012, St Augustine's Catholic Primary School, SWEEEP, Tidemill Academy, Waste Electrical and Electronic Equipment, WEEE man, WEEE Week 2012 | Permalink. WEEE Week officially gets underway starting 22nd October and finishing on Friday 26th. 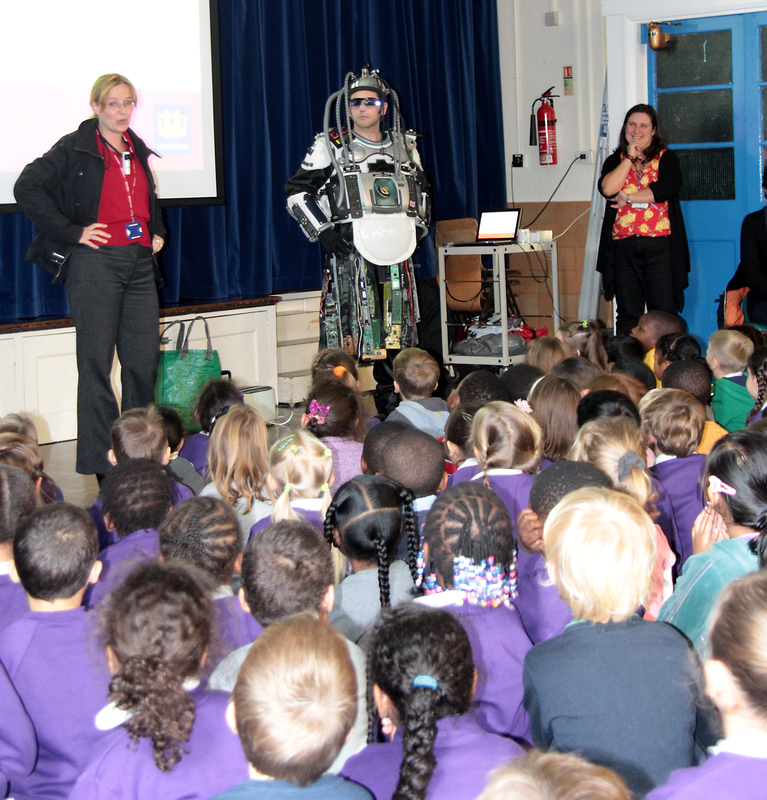 Last week the recycling team and local superhero WEEE Man visited 5 primary schools across the borough to talk to children about what to do when their old toaster, radio, CD player, video recorder, old phones, irons, kettles hairdryers, vacuum cleaners etc. stop working and they need to be thrown away or disposed of. Bring along your old and unwanted small appliances for safe disposal and recycling. We told the children that they mustn’t throw their old electronic waste in the recycling bin as it would cause us lots more problems with contamination at the Bywaters recycling plant. We also don’t want the old electronic waste to go into the refuse bin either as this isn’t the correct disposal route and it also wastes the opportunity for us to do any useful recycling. 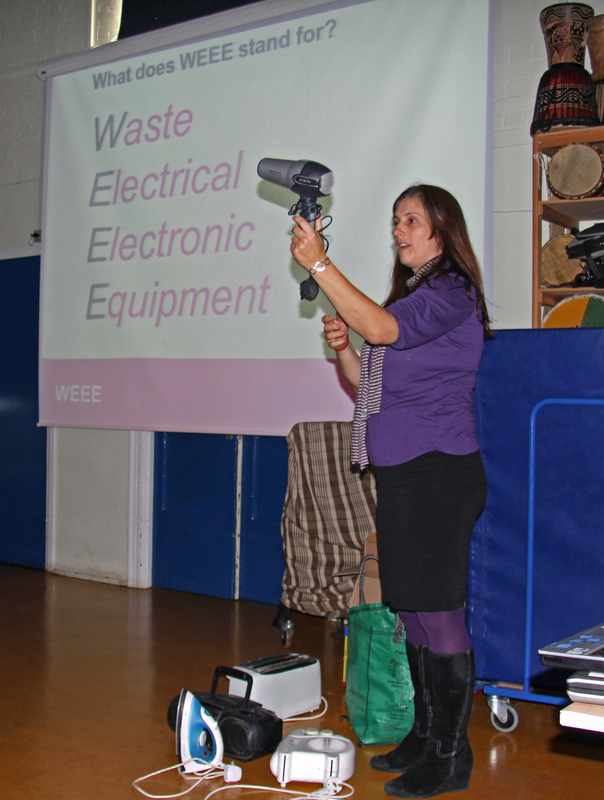 However, during WEEE Week, 22nd – 26th October, we will be visiting all the 5 schools where we held assemblies with the children again to collect unwanted items of electronic waste. The collection of the old and unwanted items of waste electrical and electronic equipment will be taking place at the following schools between 9am – 12pm. Friday 26th – St Augustine’s Catholic Primary School, Dunfield Road, SE6 3RD. Please note: We won’t be able to accept TV’s, fridges or fluorescent tubes as these are classed as hazardous waste which we are unable to accept. Categories: community engagement, WEEE | Tags: Adamsrill Primary School, Coopers Lane Primary School, John Stainer Community Primary School, Small appliance collection during WEEE Week 2012, St Augustine's Catholic Primary School, Tidemill Academy, WEEE collections at schools 2012, WEEE collections in Lewisham, WEEE Week, WEEE Week 2012, WEEE Week 22nd - 26th Oct 2012 | Permalink.